The capital of Laos, Vientiane, is increasingly a city of contradictions. Our annual visits sound discordant notes that grow shriller with each new year. Gleaming luxury cars (this year I saw a Lotus!) park next to broken sidewalks that expose the stinking sewer beneath. I imagine an unwary tourist falling into one of these manhole-sized openings while gawking at the cake-like decorations that frost the Buddhist temples. Tourists' cafe tables sprout bottles of Lao beer -- as tasty as it is cheap -- while Asean businessmen savour European wines. The menus of the newer restaurants in the old city centre boast bottles of wine that sell for $100 -- in a country where $50 will feed an impoverished family for a month. Amidst these anomalies is the fair trade social enterprise that we've come to see. Saoban, meaning "village people," has grown out of earlier sustainability projects in the Lao countryside. Many of these were the work of a local NGO, the Participatory Development Training Centre (PADTEC). Saoban ("Village Handicrafts From the Heart of Laos") now stands on its own feet, which ideally is the goal of all development projects. It works closely with village artisan groups in many regions of this diverse and mountainous country to provide training in business planning, product development, marketing, and access to micro-credit. In its Vientiane shop we see elaborate tapestry weaving, precious silver jewellery, intricate bamboo basketry and bags of many descriptions. 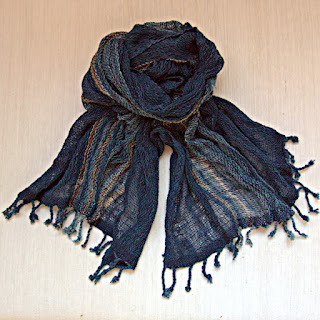 This year, however, we have come to find products woven from organic cotton dyed with natural indigo. In planning for this visit, we had a meeting on Skype (amazing that we can do some of this work from afar), while we sat in Chiang Mai, Thailand and Bandith Ladpakdy, Saoban's Manager, spoke to us from the shop in Vientiane. We're delighted to find that we do not need to make a special order: on the shop's shelves we find almost everything that we had imagined we might design together. 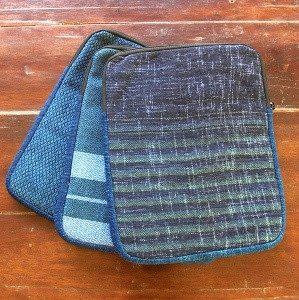 iPad pouches in indigo cotton yarn dyed with mudmee (ikat) designs are displayed almost exactly as we had imagined them! The heritage variety of organic cotton used is inter-planted with upland crops of indigo, corn, beans and chilies. 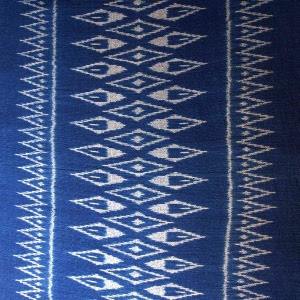 The weaving is done in Central Laos, in an area known for its indigo dyeing. 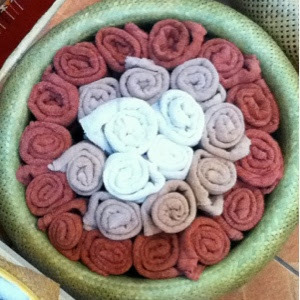 Products like these are then sewn by an urban sewing group in Vientiane, where most of the women work at home. 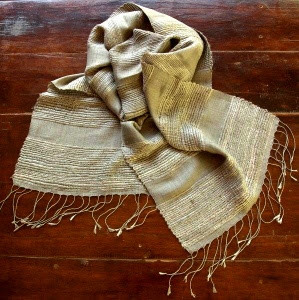 Nubbly, handspun organic cotton scarves and shawls in an assortment of naturally dyed colours are nestled into a large bamboo basket that greets us as we walk in the door. There are even 2 extraordinary handspun organic cotton shawls, yarn-dyed with traditional mudmee designs in a beautiful mid-range shade of indigo. We spend 2 afternoons at the shop. This is the first opportunity we've had to get to know Shui-Meng Ng, who has worked in development with rural Lao families for decades and is now serving as the Managing Director of the independent enterprise that Saoban has become. Bandith helps village weavers and dyers organize themselves into groups, select their leaders, learn about business planning and how to set realistic, fair prices for their work. Through his work with more than 300 artisans in 14 villages, he is becoming an important local resource. Bandith is also a key figure in a new Lao Fairtrade association formed by and for Lao social enterprises to support each other and learn about fair trade together. While our focus for this visit has been on handspun, indigo organic cotton, we are also keen to learn that village-based organic silk production is again on the rise after decades of dwindling resources and practitioners. This news prompts us to add to our shopping list an elegant but simply designed silk scarf in naturally dyed shades of gleaming, burnished metals. We look forward to continue building our relationship with Saoban and visiting some of the more remote villages with Bandith in coming years. 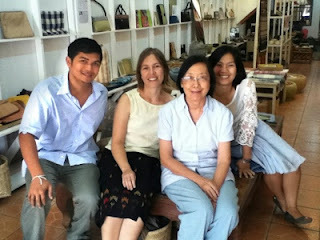 Until then, we are anxious to share our indigo Laotian treasures, and a bit more, with fans in Canada. 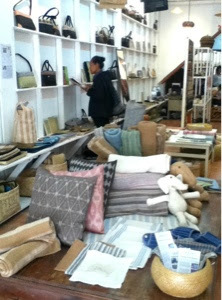 Also: See our video about a Weaving Bamboo Baskets in Laos.